Cut all the vegetable as per bite size pieces. While chopping try to maintain the same length of the vegetables. Heat oil in a wok and fry mushrooms on high flame. They become brown very quickly so fry for 2 minutes only and keep aside. Now fry cauliflower in the remaining oil till it's light pink. Keep aside. Fry carrots and baby corn together for a minute and keep aside. Add colored bell peppers and saute till they are half done. Keep aside. Now add cardamom, cinnamon, cloves and ginger paste. When it's aroma spreads , add onions and saute till transparent. Add red chilli powder, coriander and little salt. Add cashew paste and mix well with masala. When the mixture leaves oil then add tomato puree. Stir well and saute for 2 minutes. Add green peas and all fried vegetables toghether. Mix well. Add 1/2 cup of water, cover and cook on low heat till all the vegetables blend together (this will take about 5 minutes to thicken the gravy). Add coconut milk, garam masala and allow it to heat through, about 2 minutes. Apply salt and adjust according to taste. Add cream, stir well and remove from heat. Enjoy this creamy mixed vegetable with chappati or plain dosa. Different style of gravy, looks very rich and creamy with the goodness of all veggies. Wow, that's a rich gravy and cooked to perfection, would love to taste it. Wow... Looks delicious.. Super clicks dear. Wow looks rich and creamy.. love it so much. That looks So rocking good! Delicious and rich ..looks so pretty and inviting. loved the addition of cashews and coconut milk! Such a delicious,rich and beautiful side dish..
this creamy rich curry with vegetables looks awesome Deepa. Nice recipe deepa..very healthy with all the veggies..liked the addition of coconunt milk..YUM! u deserve it dearrr....go ahead n collect it...!!! I have to try coconut and cashew combination in mix veg.Sounds yum! I am in for anything coconuty and cashewy.. great recipe..
Mixed vegetables with the sauce looks yummy. So good. Love the creamy gravy, so nicely done. Great looking curry..Love to have it with rotis and paratha..Tempting clicks! Thats a lovely subji looks so delicious. What an amazing medley of vegetables in such an amazing flavorful creamy sauce.Loved it :)!!! Hi Deepa, U've a surprise in my blog..Plz visit soon.. Thanks for your comment on my blog. Your really made my day! As someone who loves to cook, your blog looks a Mecca for me! I would definitely be trying out some of your delicious looking recipes. oooh all those vegetables look great! Delicious mixed vegetables !!! Wud love to try this out !! Curry looks so delicious with coconut milk and all that vegetables. Nice recipe dear. first time here and u have a lovely blog!...glad to follow u too!...the dish look sabsolutely yummy! 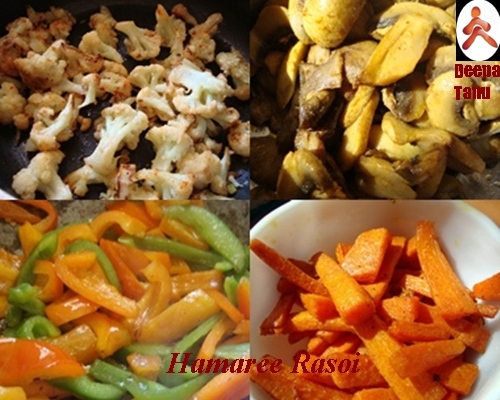 I am eating more veg than anything these days (trust me u dont want to know the reason),lol. love the combi of the spices , all the veggies , the coconut and the whole recipe! The ground nuts sure add fantastic goodness to this one! Am bookmarking this for sure and will try it soon too!